Jason Hartman feels our society is terribly overdosed on medications these days, so this topic is very important. He interviews Nicky VanValkenburgh about her book, Train Your Brain, Transform Your Life: Conquer Attention Deficit Hyperactivity Disorder in 60 Days, Without Ritalin. Nicky describes how brain training works, which is an effective, non-medicinal cure for ADHD. The cure was discovered as far back as 1967, but has been largely suppressed by the media. She talks about the symptoms of ADHD and the need for stimulation. Nicky also explains Sensory Motor Rhythm, the “light and sound” machine, and shares some success stories of people who have trained their brains with her program. The training creates new neural pathways for peak brain performance and can be done from the comfort of home. 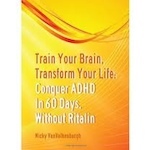 Listen at: www.HolisticSurvival.com for more information on ADHD, brain training and brain plasticity. Nicky VanValkenburgh’s book was voted “Best Self Improvement Book of 2011” by the Mom’s Choice Awards and “Best Motivational Book” by Reader’s Favorites Awards. She was also a Grand Finalist in the USA Today Book Awards, in the Health: Alternative Medicine category. Nicky is a motivational writer with 20 years’ experience writing for newspapers and magazines. She has a Master’s in Journalism, and a Bachelor’s in Psychology. She is also a contributing writer for Upstate Parent, Low Country Parent and Palmetto Parent magazines, which are published in South Carolina, with a circulation of a quarter million people. Nicky is also the Director of www.Train Your Brain Transform Your Life.com which spotlights her book and 60-day brain training program for ADHD.